The color combinations in Color Harmony are a click away with Rockport's new Palette Picker software. Interactively search for color combinations under words like "Hot," "Friendly," and "Analogous," or select a hue from an easy-to-use color wheel. Like the colors you've chosen and want to save them all in one place? With Palette Picker, you can save thousands of combinations in your own custom lists. Plus, online help is there to make exploring this powerful utility an adventure. 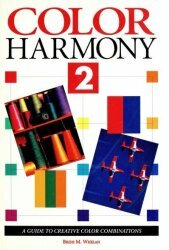 Color Harmony 2 is an invaluable tool for anyone working with color. From graphic designers to interior decorators, from fashion designers to floral arrangers, this book can help anyone create effective color schemes for any project. --Colors and color schemes matched to specific moods provide unique color and design possibilities. --12 basic hues with 94 tints and shades give more than 1,400 color combinations in single-,two-, and three-color schemes. --Vivid color photographs illustrate many different color combinations. --Color swatches and a color conversion chart assure easy and accurate color matching. --Easy-to-follow lessons in basic color theory.